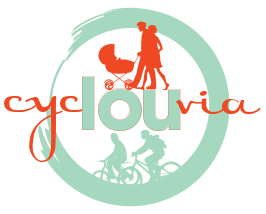 CycLOUvia, the popular event showcasing alternative transportation, is returning to Bardstown Road for the seventh time on Sunday, October 21. The CycLOUvia on Bardstown Road is named in honor of former District 8 Councilman Tom Owen, a lifelong advocate for bicycles and pedestrians in our community. Bardstown Road from Douglass Boulevard to Broadway will be closed to vehicular traffic from 2-6 p.m. Police will facilitate motor crossings at Grinstead Drive and Eastern Parkway. Many businesses along the corridor will be open and engaging pedestrians with special events. The return to the Highlands marks the fifteenth CycLOUvia event and seventh on Bardstown Road. Previous events have been held on Frankfort Avenue, West Broadway and in Three Points (Germantown, Schnitzelburg and Shelby Park). Commercial establishments with frontage along the Bardstown Road corridor are encouraged to open their businesses during event hours and to engage participants, creating an atmosphere that is uniquely Louisville.